Naval installations in the National Capital Region will conduct Exercise Citadel Shield-Solid Curtain 2019 (CS/SC 19) Feb. 4-Feb. 15, 2019. These naval installations include Joint Base Anacostia-Bolling, Naval Support Activity Washington, Naval Air Station Patuxent River, Naval Support Activity South Potomac, Naval Support Activity Annapolis, and Naval Support Activity Bethesda. 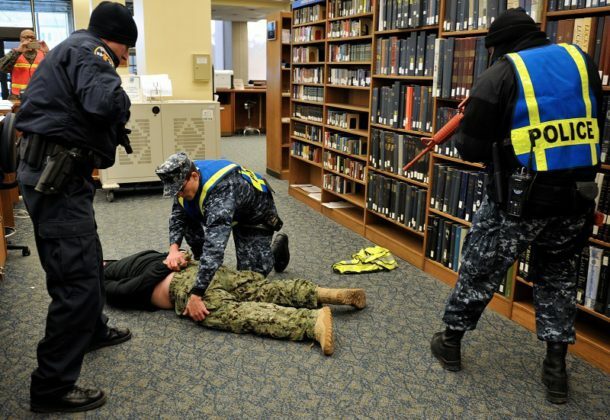 CS/SC 19 is a two-part, linked anti-terrorism force protection exercise conducted by Commander, US Fleet Forces Command and Commander, Navy Installations Command on all CONUS Navy installations. The annual exercise is designed to enhance the readiness of Navy security forces and ensure seamless interoperability among the commands, other services and agency partners. Exercise CS/SC 19 is not in response to any specific threat, but is a regularly scheduled exercise.